Description: This robin-sized shorebird has dark greenish-brown shoulders and back with light colored spots. The head, neck and upper chest are streaked gray and dark brown with a white lower chest, belly and undertail. Green (rarely yellowish) legs, a prominent white eye ring and a greenishgray based black-tipped bill, which may appear slightly drooped at the tip, are also characteristic. Their flight pattern is slow and floppy, similar to that of a swallow. Upon landing, Solitary Sandpipers often “wing stretch,” pointing their wings to the sky before relaxing them to the side. 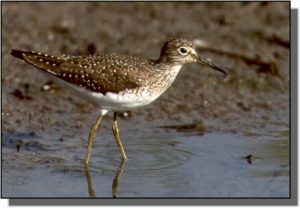 Similar Species: Green legs and darker plumage distinguish this species from both species of yellowlegs. Solitary Sandpipers “bob” in a manner similar to Spotted Sandpipers, are slightly larger and less “chunky” than Spotted Sandpipers, have a clean white underbelly and chest and light, rather than dark, spots on their back and wings. Comments: They are often seen as a single bird as their name implies. They will feed for long periods of time in a relatively small area, moving slowly and carefully, while examining the water surface for food. They nest in trees in the taiga (northern coniferous forest) of North America, winter in South America and are seen throughout the Great Plains during migration, usually along freshwater ponds, water treatment facilities and open rivers.